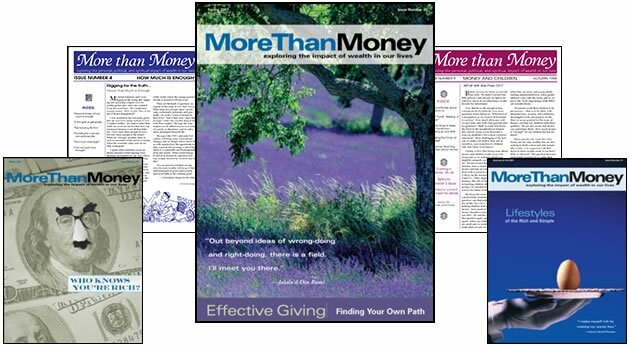 More Than Money Journal, published quarterly from 1993 - 2006, was one of the first public forums where people shared personal stories about the impact of wealth in their lives. Bolder Giving is excited to offer all 43 back issues in a new Archived Editions format as a resource for families with wealth, philanthropic advisors, and all those exploring how to best align money and values. The themes and stories in these journals ring as true today as they did when first published. The Ellingers are also founders Bolder Giving. order print compilations by theme. #2 What Makes Giving Satisfying? #20 How Much to Give? #24 What Are We Teaching Our Children? #28 Who Knows You're Rich?